Maintained by us, to as near perfect original specification as possible. Beautiful to photograph, our cars enhance white or ivory dresses and contrast well with many different colours of gowns and outfits. All of our cars compliment each other, any one would be a perfect choice for your wedding. The deeply sprung seats make an unforgettable, delightfully smooth and comfortable ride. The smell of leather and polished walnut remind you of years gone by. Popular dates go so very quickly, so please book early to avoid disappointment, and remember, we only book one wedding per car per day, assuring you of our best attention. To confirm your reservation with us, please email or telephone (see our contact page) to pencil in your date. A booking fee of £50.00 per car will be required and the balance is payable eight weeks prior to your wedding. The understated elegance, luxury and sophistication of our (Rolls Royce) Bentley Mk VI saloon, finished in black over ivory, with a sumptuous ivory leather interior, spacious enough not to crush the bride’s dress, seats three plus driver with comfort, or four younger bridesmaids plus driver. Matching the rest of the fleet, in black over ivory and has a light grey interior, same as the convertible, this Daimler limousine offers two alternative seating arrangements in the rear. With the occasional seats folded down, six/seven adults can be accommodated in comfort. With these occasional seats folded forward, an exceptionally spacious rear cabin is available with over three feet of legroom, ideally suited for bridesmaids, family and large wedding dresses. 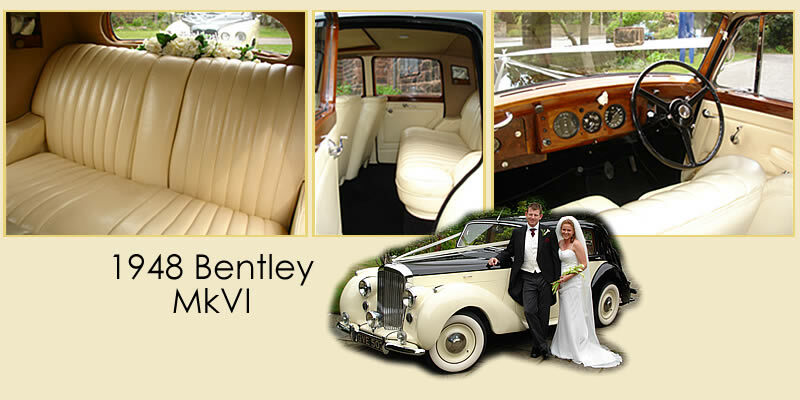 All cars carry large umbrellas which will keep the bridal party dry if you are unfortunate enough to have wet weather. Finished once more in black over ivory and has a cream/ivory interior, this Daimler limousine offers two alternative seating arrangements in the rear. With the occasional seats folded down, six/seven adults can be accommodated in comfort. With these occasional seats folded forward, an exceptionally spacious rear cabin is available with over three feet of legroom, ideally suited for bridesmaids, family and large wedding dresses. This car has the rear section of convertible roof that folds down. Allows lots of light in for photos, plus it hardly disturbs your hair (unlike full convertible cars) whilst the car is in motion.